Four vertical padded handles for easy assistance. 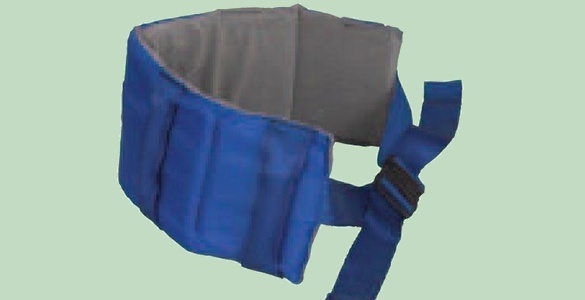 Padded belt for patient comfort. ErgoSafe’s® Soft Transfer Gait Belts combine the basic principles of ergonomics into an extremely durable and comfortable patient moving aid. With four large padded handles and an adjustable buckle to employ the proper fit, these transfer gait belts are an ideal solution to implement in your health care facility or nursing home for safe patient handling. The “softness” promoted by this product ensures not only a comfortable fit for your patient, but also commands comfort for the caregivers, as well as helps reduce the risk of injury by instilling proper patient transferring and moving. The Soft Transfer Gait Belt is similar to ErgoSafe's™ Walk-n-Lift Gait Belt, as both belts seek to accomplish the same goal of safe patient handling procedures. Replacing the Velcro™ fastening system with a buckle, our soft gait belts are ideal when in use with patients whose body shape demands the durability and stability of a buckle fastening system. This belt can easily adapt to numerous sizes and patient builds. For additional support, this soft transfer gait belt construction boasts "slip resistance" and should not ride up once fastened.